In the United States, doctors must report any diagnosis of cancer to a state registry. The federal government, through the Centers for Disease Control and Prevention’s National Program of Cancer Registries, oversees the registries in 45 states, the District of Columbia and three territories. The Surveillance, Epidemiology and End Results (SEER) Program of the National Cancer Institute funds the remaining five statewide cancer registries. Together, the two programs cover the country’s population. Keep up with the latest statistics by joining our email list. The following statistics come primarily from the most recent findings of the Surveillance, Epidemiology and End Results (SEER) Program of the National Cancer Institute. SEER numbers are age-adjusted and based on actual data. SEER data is available for most data through 2014. 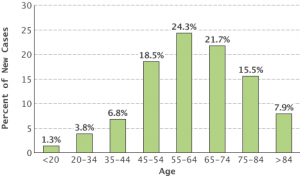 More recent statistics are projections from the American Cancer Society. The American Cancer Society estimates that in 2018, about 22,240 new cases of ovarian cancer will be diagnosed and 14,070 women will die of ovarian cancer in the United States. Mortality rates for ovarian cancer have declined only slightly in the forty years since the “War on Cancer” was declared. However, other cancers have shown a much greater reduction in mortality, due to many factors. The Surveillance, Epidemiology and End Results (SEER) Program reports that in 2014 in the United States approximately 222,060 women were alive who had been diagnosed with ovarian cancer (including those who had been cured of the disease). 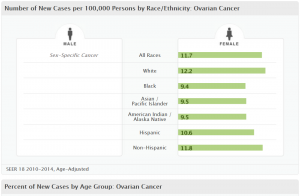 Ovarian cancer accounts for 2.5 percent of cancers in women. While the 11th most common cancer among women, ovarian cancer is the fifth leading cause of cancer-related death among women, and is the deadliest of gynecologic cancers. Mortality rates are slightly higher for Caucasian women than for African-American women. A woman’s lifetime risk of developing invasive ovarian cancer is 1 in 79. A woman’s lifetime risk of dying from invasive ovarian cancer is 1 in 109. The median age of death from ovarian cancer is 70. Ovarian cancer survival rates are much lower than other cancers that affect women. Five-year survival rates are commonly used to compare different cancers. The relative five-year survival rate for ovarian cancer is 46.5 percent. Survival rates vary greatly depending on the stage of diagnosis. Women diagnosed at an early stage—before the cancer has spread—have a much higher five-year survival rate than those diagnosed at a later stage. Approximately 15 percent (14.8 percent) of ovarian cancer patients are diagnosed early with early stage disease.